Late summer: the time of year when I look at the abundance of my garden and start taking away what is too much: pruning, thinning and removing diseased plants. I call this simplifying the garden and opening up space for ideas gleaned from seminars, trade shows and garden tours. But first, I have to deal with nature’s effects on the edibles. We can all agree that this has been another challenging growing year. Mother Nature has muddled the spring and summer seasons with excessive rain and unseasonable lower temperatures. 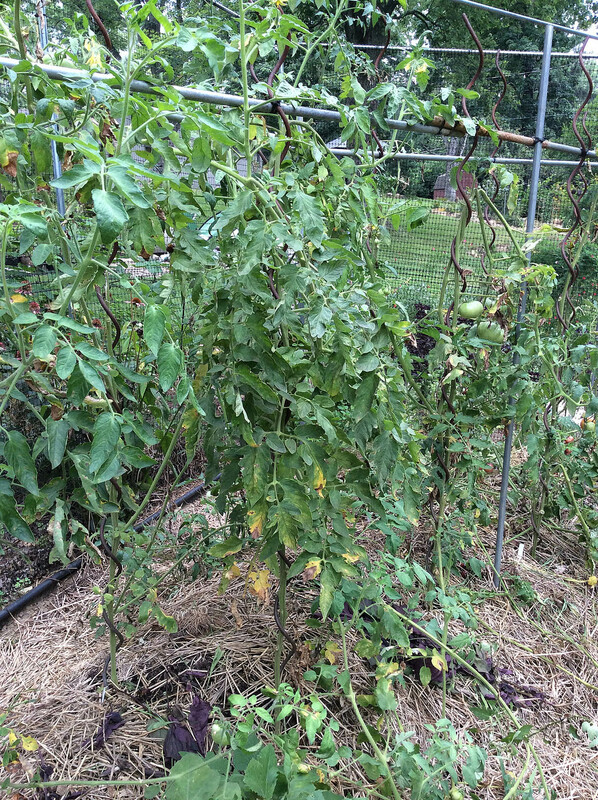 By the last week in June, my tomato plants were gorgeous; loaded with blossoms and fruit… all green. We had lots of rain and little sun in May and June. The temperatures – while delightful for humans – were not hot enough to develop colorful and tasty fruit. By the second week of July early blight plus Septoria leaf spot showed up on tomato leaves – see above. We finally had some hot, sunny days in July, but this generated severe sunscald on the tomatoes. They were not accustomed to sunny days. Low temperatures caused most of my tomatoes to ripen unevenly resulting in irregular coloration, white spotting, mealy texture and little true tomato flavor. To add insult to injury, anthracnose lesions developed on the tomatoes that were ripening well. 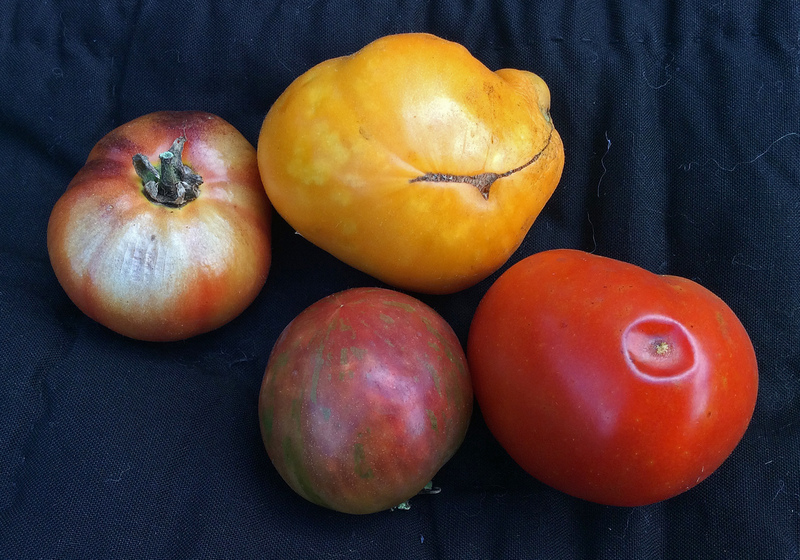 Left to right: Black Krim tomato with sunscald, middle Black Krim and Gold Medal tomatoes show mottled coloration that indicates low temperature conditions and lastly, an undersized Brandywine tomato with anthracnose. Are these tomatoes safe to eat? Yes, but after you remove all the diseased sections, there isn’t much left. What does one do with tomatoes such as these? Make tomato sauce. Now, I have plants that are covered with disease. This calls for an experiment. I removed all diseased portions of each plant, rinsing my pruners and fingers in 91% alcohol as I moved from plant to plant. I cleaned up the area under the plants and then watered in a low nitrogen organic fertilizer. These are my Charley Brown tomato plants, and I wonder if they will be able to rebound from all of the above. Next sad story concerns basil. I started my own plants this year in an effort to bypass the downy mildew disease that has plagued my favorite pesto herb. My 32 plants started off great. I kept them evenly moist and healthy with compost tea. Just as I was thinking to plant them out – late May – I noticed my plants had downy mildew. Do not allow the soil to dry out – avoid water stress. 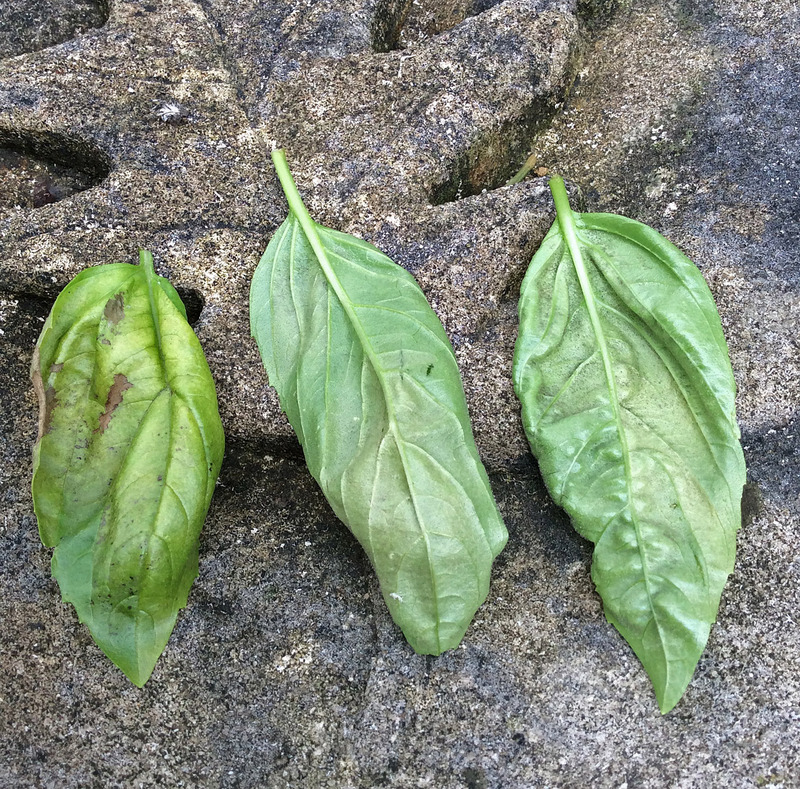 Below are three infected leaves. On the left is the top of the leaf. Notice the blotchy yellowing. The other two leaves show the “gray” infected areas under the leaf. Take a closer look and you can see the spores; the carriers of downy mildew to the next leaf or plant. The below plant was doing well, but I was at a conference for a week and this is what I found when I returned. Downy mildew has returned. I missed my pesto-making window. This plant has been moved to the “bad” compost pile. I have since destroyed my most affected plants – the triage – and then removed affected leaves from the healthier plants. I am trying a product: BioSafe Disease Control. It is based on hydrogen peroxide which has been shown to have a preventative effect on water molds. I will let you know. There are other tales of woe, like swamped lavenders, and tales of joy: having the best summer phlox bloom ever. But that is for the next post. My tomatoes are pitiful “Charlie Brown” plants, too. I cleaned up all the brown gunk – didn’t leave much. But the plants I cleaned last week are looking better and there are even flowers. So there is hope! Now if I can just win the deer battle. The doe who thinks my yard and garden is her personal snack bar is drop gorgeous. All that organic produce she has consumed???? Sigh. 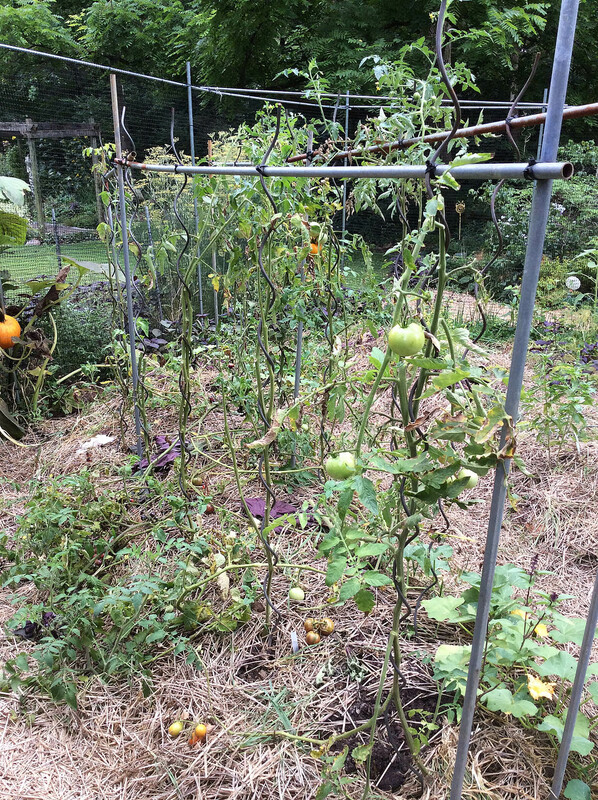 Linda – your experience has given me hope for the development of some late season tomatoes. As to your deer problem: the rain in the spring often washed off the repellents that I sprayed so the deer have eaten more of my garden than usual. There are systemic repellents, but I am reluctant to use those on edible plants; something I need to investigate. 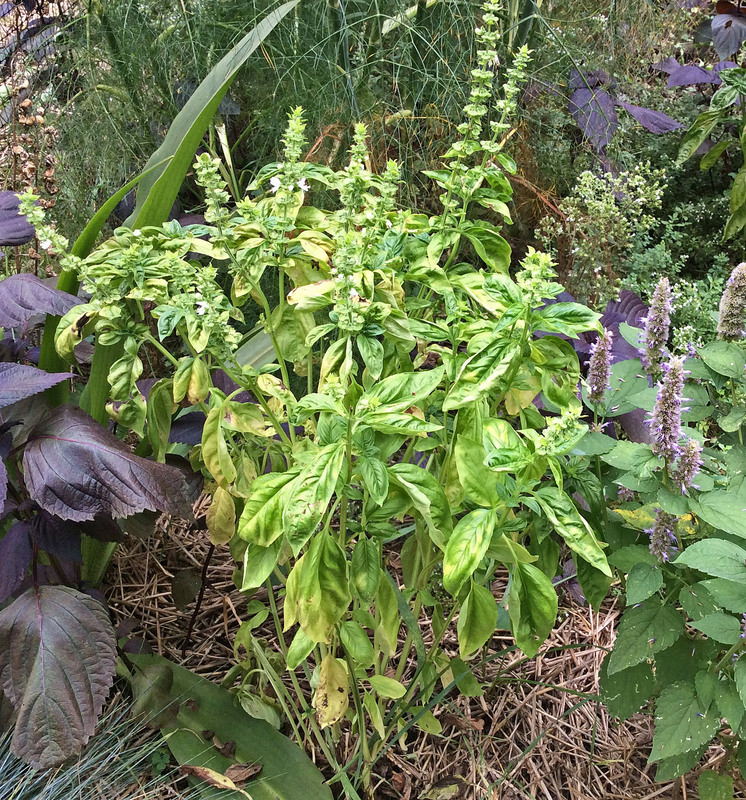 I’ve had terrible trouble with basil downy mildew. I think once it’s in your local environment, you’re pretty much screwed. Have you tried contacting Meg McGrath at Cornell University? John – I enjoyed your post and saw that we posted the same types of pictures (Great minds think alike?). This is gratifying from a colleague point-of-view, but sad from a pesto point-of-view. To fill in the basil pesto black hole, I am now making sage pesto, rosemary pesto (a little goes a long way), garlic scape pesto and celery pesto (incredible on omelets and frittatas). 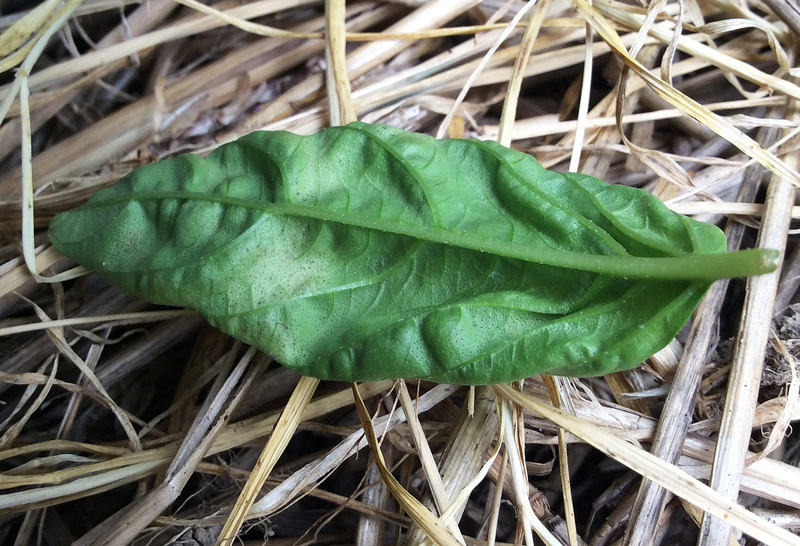 With that said, hopefully we will find a way to deal with basil downy mildew, because nothing really takes its place in flavor. Isn’t gardening a mystery! And such problem/success variations from year to year and location to location. Here in Ottawa, Canada my tomatoes are disease-free this year. Our weather has been similar to yours (I can’t remember a year in 40 years of gardening that I’ve rarely had to provide supplemental water to gardens) and I would have expected huge blight and other disease problems due to the timely rainfalls that we’ve experienced. But no, just gloriously humungous plants laden with flowers and fruits. One thing differnt this year was my planting-out date—about two to three weeks later than usual. I hesitated to transplant (especially my tomatoes and potatoes) my self-started plants into unusually cool soils. I have tomato plants both under plastic (in a high tunnel where they get no moisture on leaves) and outdoors (subjected to weather vagaries) and some which have self-seeded and are now developing green fruit. All, amazingly, are disease-free and have been without any preventive measures. Could it be that, by delayed planting out, there is a possibility to avoid wind-borne pathogens? P.S., our garden phlox, cucumbers and squash have no disease symptoms too. Hi Phil – Fungi travel via wind, water and animal vectors, so your question about planting out later has a lot of merit. Maybe you avoided the start of the infection period and gave your tomatoes a better growing environment – less stressful – in warm soil. I know my soils were much cooler than our sun-loving vegetables prefer. Thank you for reading and offering the Canadian point-of-view. It just shows how similar (and how different) growing conditions can be elsewhere. You are welcome … and today I have to do a good tomato plant pruning to open up my overly-leafy sky-reaching plants. By the way, in supporting my tomato plants I re-purpose farmer-discarded page wire fencing. I cut five-foot units from the roll of fencing and make a cylinder by bending the cut horizontal strands of wire around the opposing vertical wires. At planting time I dig a hole large enough for the cylinder of wire to be buried up to the first horizontal strand of wire and place the cylinder and young tomatoe plant in the whole. Tthe hole is then filled in allowing about three leaves of the young plant to be exposed to the sun. The cylinder of fencing becomes self supporting for the season because of the gradual settling and compaction of the soilon the buried horizontal wire strand and the cylinder provides great support for a mass of tomato branches and their fruit. Looking forward to a meet-up at Garden Writers Symposium in Sacramento. I meant to say ” meet-up in Pasadena”! Is there a way to edit posts when one spots an error? I have no idea how to edit other than to write a “mea culpa” post 🙂 Thanks for the tomato support idea and see you in Pasadena.